How often should I microderm? Microdermabrasion is a painless procedure with minimal risk that removes dead cells at the skin’s surface. Medical spas and clinics are no longer the sole domain for microdermabrasion. Affordable creams and machines can be bought and used at home. Microdermabrasion is used to reduce the appearance of fine lines, mild sun blemishes, age spots or shallow acne marks. It’s typically applied to the face, although the treatment can be used anywhere on the body, including the neck, hands, chest or back. This popular skin rejuvenation technique employs tiny crystal granules of white aluminum oxide that come in various geometric shapes, with lots of corners and edges to gently abrade the top layer of skin. Note that microdermabrasion should not be confused with dermabrasion, an invasive surgical procedure for deep wrinkles or acne scars that is generally performed under anesthesia. There are basically two formats of at-home microdermabrasion: creams and machines. Both use tiny crystals to polish the skin and can be found in larger pharmacies, big national retailers like Target and Wal-Mart, or can be purchased online from Amazon. Most microdermabrasion creams on the market – ranging anywhere from $10 to $100+ USD – are formulated for use on the face, meaning they’re gentler than body creams, which should not be applied to the face or other delicate areas. The crystal-laden creams differ from regular scrubs and exfoliating creams that usually contain fine sand, salt or sugar crystals. There are so many different kinds of microdermabrasion creams, serums and lotions on the market. It’s vital to read the ingredient list carefully as some of them may contain chemical peel products that may not be suitable for people with sensitive skin. Since so many popular beauty brands feature their own version of microdermabrasion creams, it’s perhaps best to go with a brand you trust and check the product reviews. The Mary Kay cream and the one by Olay have similar ratings on Amazon, although the Olay product has been reviewed by far more consumers. Already have a cleanser that works well for your skin? No problem. You can even add microdermabrasion crystals to your favorite facial cream. Simply purchase a jar of NeedCrystals Microdermabrasion Crystals, which contains very fine granules of white aluminum oxide. These granules are smaller than table salt and can be mixed in to transform any cleanser into a microdermabrasion treatment. 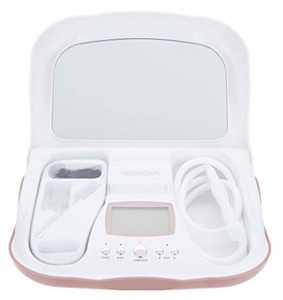 In the last few years, more affordable home microdermabrasion machines have become readily available online and in stores, retailing anywhere from $100 to $300 USD. These machines work a little like a combination leaf blower, electric sander and vacuum specially designed for the skin. 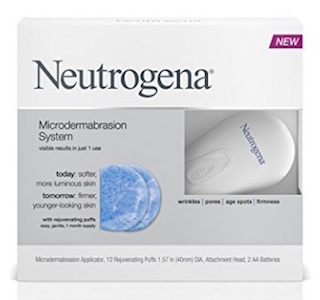 There are a number of smaller and cheaper (under $50 USD) handheld options with rotating brush heads made by popular beauty brands like Neutrogena and Olay ProX. 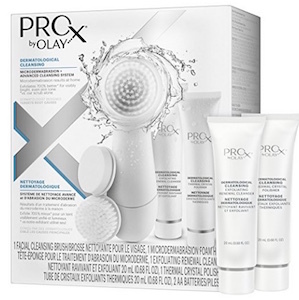 Of these, the Neutrogena model is rated the highest while the Olay machine has the most reviews. 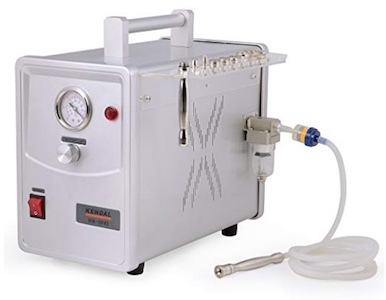 Among the higher end diamond peel models, there’s the Kendal Professional Diamond Microdermabrasion Machine, which features a diamond head and 3mm friction depth. The MicrodermMD device is a mini-version of the larger machines found at medical spas and clinics. It has an LED display, diamond tip wand and a 5X-magnification mirror. Guffey recommends it over the Kendal as she claims the latter is harsher and increases the risk of over-exfoliation. Higher end at-home machines like the MicrodermMD and the Kendal Professional Diamond Microdermabrasion Machine are the real deal as they offer effective microdermabrasion at home. For instance, many of her clients choose to undergo a micropeel, which is a microdermabrasion followed by a chemical peel. The products can then reach further into the skin once the dead cells have been removed and better target fine lines, acne scars and blemishes. After experiencing results from polishing away those dead skin cells, it can be tempting to go overboard with the cream or machine versions of microdermabrasion. Too deep or too frequent microdermabrasion can cause redness, bruising, skin sensitivity, or trigger certain conditions like post-inflammatory hyperpigmentation. If you are using a machine at home, Guffey recommends that you undergo treatments no more than once a week at first, and then space that out to every 4-6 weeks. After getting started, monthly maintenance sessions make sense as human skin usually regenerates every 30 days. There are no specific age guidelines, but microdermabrasion at home or in the clinic is typically recommended for older teens and adults no more than age 70 years since very young and very old skin are more prone to irritation and bruising. “I always caution people to use their best judgment, and remember — less is more,” Guffey says. As technology for skin care becomes more readily available for anyone to purchase, it may be worthwhile to check in with a professional to get recommendations on what would work best for your skin type so you don’t cause more harm than good. Guffey concurs, stressing that consulting a dermatologist or aesthetician before you start microdermabrasion at home can help you determine the best treatment plan and frequency for you. » To find out which type of skin rejuvenation treatment is best suited to your needs, ask a cosmetic doctor for advice and schedule an appointment using Zwivel’s free online consultation tool.